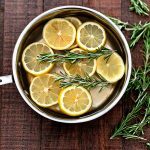 Make your home smell amazing with this simple Stovetop Potpourri! Place all ingredients in a pot and simmer. Vanilla bean can be used in place of vanilla extract.